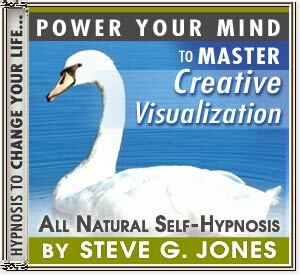 MASTER CREATIVE VISUALIZATION WITH HYPNOSIS!!! In this special CD/MP3,Dr. Steve G. Jones M.Ed. shows you how to harness and properly utilise the technique of Creative Visualization to completely change your life for the better! For me, some of my best ideas seem to randomly pop into my head. Sometimes I’m not even trying to focus on my work and I visualize a new idea. The other day I was running some errands and I got a new idea for a product line to offer on my website. With hypnosis you can achieve creative visualization.